Average cost of electricity – are you in line with everyone else? Seasonal variations – shown clearly on the graph, highlights pool pumping, irrigation. All this is analysed in the context of your situation and a comprehensive document then presents the results with recommendations for improvements. Potential savings have ranged from €5,000 to just a few hundred but they always substantially exceed the cost of the survey. Prices start at €60 but if there aren’t any savings to be made then I won’t charge at all. You might think you’ve done the bulbs thing by buying a few eco bulbs; those curly things that take ages to warm up. Things have changed now because LED bulb prices are falling. For similar money to a curly bulb you can now replace an old 60W bulb with an 8W LED, so 7 times better. They commonly come in sizes down to 4W as well. Every 1W used for 8 hours a day costs €1 a year. So roughly speaking Watts are Euros. So. Say tonight you have 20 light bulbs on at 60W each that’s €1,200 a year. The same set on LEDs would save the €1,000. Fancy a scary movie tonight: walk round the house and count the Watts – don’t scream at the outside lights. I think the time has come to start buying LEDs. They come in all the usual fittings and there are some neat little GU10 and saucer like GX53 fittings for new installations. For the audits I’ve had to build a model to study the effects of changing over to the special Enel BTA3 tariff for heat pumps. The heat pump has to be independently supplied with its own meter and while the fixed costs are a bit higher the running costs are lower. The surprise of this exact modelling is the way the original D3 bill is not only reduced because of the heat pump removal but the expensive end of the bill is top sliced to give a lower average charge. Savings range from around €500 for light users to several thousands for heavy users. If you have, or are considering, a heat pump then I’d suggest you get your numbers crunched on this model. My main integrated heating model which compares and prices all inputs on a seasonal basis now incorporates this tariff and effectively adds all electricity costs to make a totally comprehensive energy prediction. For example the seasonal power requirement curve for your house can be matched by a stack of sources including solar thermal, wood, PV, and ASHP and all these can be juggled to arrive at the best heating strategy for you. Early investigations of the new net metering scheme look interesting and for some users PV is a runner again. Net metering is pretty basic. You benefit from the free power you consume and any excess is effectively exported and stored for later consumption but subject to a handling charge. Because the cost of electricity has risen so sharply over the last 5 years the savings are rather like a generous feed in tariff equal to the cost of buying electricity. That is to say that the panels make around €0.33 per kW.hr if you would otherwise have paid for that electricity. The benefits vary a lot depending on the size of the array relative to your normal consumption. Users with a consistent day time load, such as a heat pump charging big water tanks, will benefit most. To get a grip on where the boundaries are let’s take a 5kW array costing €15,000 and assume that all production is consumed with nothing exported. For central Italy the defrayed electricity bills are worth just over €2,000 so the upper limit for returns is 13% tax free. With heavy summer air-con and pool pumping you might get close to this, otherwise it starts to look less appealing. If you pay tax in Italy then grants are available on the installation and the whole plot looks much more interesting. For PV anywhere in Umbria or Tuscany contact me for help with the appraisal and installation. We’ve seen how the constant load from a heat pump can make the PV prospect more attractive so let’s flesh out the scenario a bit with a real world example. A 6kW array in winter sunlight would match the 2.5kW consumption of a small 7kW heat pump on a realistic COP of 2.8. The heat pump would therefore heat some 100 square metres of floor space, free of charge, for about 5 hours on 3 out of 4 winter days. There are night hours too so only half the bill will be met but the saving for a typical house will be €1,000. If you like to fire up a stove in the evenings this scenario is the best you can get without doing masses of log lugging and particularly suits anyone working away from home. Next Seminar – March 18th Start time 9a.m. There a couple of places already booked so please secure your place now if you’d like to come. • Heat pumps – what are they really like? The chart for the average high and low temperature range for Perugia shows a significant drop at night. Even during the hottest nights the outside air is cool enough to be used for extra house cooling. The night temperature is often around 16 degrees with a brief rise towards 20 degrees in August. These temperatures would call for the heating to be on if they were inside the house! Cooling the house with this chilly air couldn’t be easier although we need to shift a lot of air to make a difference. The simple DIY solution is to take a north facing downstairs window (with mosquito netting and security bars) then use an ordinary desk fan on the windowsill to pull in cold air at night. Make sure there is a similar vent upstairs for the displaced hot air to escape. A simple timer plug would set the fan running every night but if you wanted to go one step further on the control side then a simple solar controller could run the fan whenever the outside temperature sensor was cooler than the inside one. No seriously! If I put a moderately big log into the middle of my stove the carcass thermometer drops from 300C to 200C. As heat transfer is proportional to the excess temperature of the surroundings (say 20C) then this is a 35% drop in heat output and it feels like that too. So what is going on here? Well it’s the water in the wood consuming latent heat as it turns to steam at a paltry 100C. Until that water is cooked out the fire will be suppressed, and very inefficient, as many of the tarry creosotes don’t burn in those cool, moist conditions. To keep the fire really hot it’s best to feed wood in at the sides where it can toast dry for a while without cooling the hot centre. The drying process can also take place outside the stove if the wood is stacked around the stove for a while. Have a go at this and you’ll find your stove seems to be better straight away. The chemical reaction also spools up better with more burning surfaces reflecting heat onto each other so many smaller bits of wood will make a big difference too. just 2 or 3 small glowing coals from the night before will be fine. Scrape a small pit through the ash just big enough to hold the coals and all the way through to an opening in the grate. Knock the coals into the hole and throw a small handful of kindling dust and small wood chips on top. Now with the doors closed and only the grate vent open a draught will come up from the grate to fan the coals into an instant blaze to catch your dried morning sticks … so quick you can get it done before the kettle boils. One way to ensure there are some coals there in the morning is to leave the fire burning on one side only with a stack of heavy logs on the other side waiting to catch later. Not too many logs either or the fire will get very hot and burn everything out before morning. This is about circulating domestic hot water around a loop so that any connected tap has a nearby source of instant hot water. No wasted time and no wasted water down the drain while you wait. The loop is constructed by returning the flow to the heat source after passing the last tap or shower spur; simple and cheap enough. A small pump on the return side maintains circulation. This used to be the province of big houses but as we seek greater efficiency and water conservation it will become more mainstream and probably compulsory for new-build houses. 1/. A time clock on the pump runs it at times when you might need hot water. This is outdated and only suited to people living on a strict time schedule. The timer needs resetting whenever leaving the house unattended although it can be left on for useful frost protection. 2/. A pressure or flow sensor starts the pump on first use and then times out after a few minutes. Very economical but you need to remember to give a hot tap a quick run before your shower by cleaning your teeth first for example. I love the idea of starting the pump with a movement sensor in the bathroom and having the lights turned on at the same time. Visitors never know where the bathroom light switch is and they’ll appreciate having instant hot water too. 3/. Grundfoss sell a smart pump for circulation. Not only does it slow down when the return flow is hot enough but it starts when any flow is detected and then learns your regular habits to pre-empt any future demands. 4/. If you extract hot water from a heat bank via plate heat exchanger then circulation is less simple because the hot water is being pumped out of the top of the tank and sent to the bottom even when you are not using it. The most sophisticated heat extraction units go as far as returning the flow nearer to the top of the tank when it is hot and only to the bottom when it is cooled through use. They also reduce the pump speed so they have all the bases covered, but at a price. Expect to pay up to €2,000. 5/. My DIY solution. A Steca module is available to start and stop the pump. Use a Grundfoss Alpha2 pump or similar and a temperature limiting valve to throttle the return flow when the required temperature is reached. When the return flow slows then so does the pump and economy is preserved. As you can see there are many ways of circulating water – you’d think a simple thing would have a simple solution. While it might seem rather obvious that you only need to heat the rooms you are using this logic has by-passed a few installers and one still sees houses where the heating is either all on or all off. Usually a gesture to efficiency is made by having thermostats giving separate temperature control of upstairs vs. downstairs but no more. What is lacking here is time control so that you can decide when the temperature control is applied and crucially, when it is not applied. Efficiency, economy and comfort can be hugely increased very quickly and cheaply in most cases. All that is needed is to change the old thermostats for programmable ones so that they introduce time control as well as temperature control. With this simple change the downstairs heating can be set to go off shortly before you go to bed and the bedrooms heated in advance, and vice versa in the morning. With such tight control those thermostats could recoup their cost in the first month. For simple installations my favourite progstats are the Btcino L/N/NT4450 which are easy to set and give 48 on/offs a day and so can be fine tuned in half an hour increments. For a more sophisticated approach see below. I believe current regulations ask for each bedroom to be separately zoned with individual thermostats so if you are building or restoring then this is a must. Rectifying old houses in need of zoned heating. If your old system consists of a series of radiators that are all on or all off with maybe just one thermostat, or even none, the situation can still be remedied. What you do is to make each radiator a zone by changing the radiator thermostatic valve with a programmable one. These are neat little things and cost about £25. Going even further one could fit Z-Wave radiator thermostats all round and control them from your i-phone. Whatever you do it’s good to know that an old house can be made as tightly controlled as any modern one. I rang ‘last orders’ on PV in the last newsletter and as the GSE quota got progressively taken up it looked last week as though the end was under a month away. However as we near the end the rate of take up has declined with the calculated end day now pushed out to 155 days. That will fluctuate but the odds are that, perversely, it could even increase as the probability of a successful application decreases or appears to decrease. The plug has been pulled on ground installations – no more huge PV farms but also no little ones in your garden. It’s just roofs and car ports from now on. My PV installers take a sensible approach. You pay them (and risk) €421 for comune surveys and fees and they do their best to beat all the deadlines for you. They do a lot of work to push all this through so it’s a big loss leader for them at this rate. The feed-in tariffs have all changed again and now a payment is made for power exported and a lower rate paid for your own consumption. This looks a bit strange at first glance but you are effectively paid for all production with a reduction penalty for consuming some of it. Plant costs continue to fall and the payback period remains at 7 – 8 years although of course the power for money ratio is at an all time high. As energy prices rise the payback time will fall of course. €8,580 for a roof mounted 3kW with a total return of €1,000 a year. €13,000 for 6kW so some economies of scale here. € 14,000 for a 4.6kW car port. Of course there may be another regime when the current tranche ends. There is talk of it being based on tax rebates though so for most expats it will be a non starter. The price list is issued in January and last year it was left unchanged giving us 2 years of stability. I doubt if they will hold prices in January 2013 so if you are contemplating one now is the time to give me a call. As ever the 750 flat top is the most popular for water heating applications and the Vision 500 for stand alone installations. My new model, running on my PC, continues to be useful in evaluating various mixes of heat sources and making a fuel bill prediction. With more heat pumps being considered there is an interesting new slant on solar thermal panels. When compared to gas power they were saving something like €600 a year but compared to an efficient heat pump they only save about €200. So with a limited budget would you spend say €3,000 on some panels or €6,000 on an installed air source heat pump? Not such a no-brainer any more is it? Did your wood run out last winter? If so how much does one need to get through another cold one? A regular stone family house here needs 25,000kW.hrs of heat and 90 quintale of dry wood should do the trick. That’s about €1,000 worth but a lot depends on how dry it is when you buy it. To be sure of dry wood you need to buy before the summer baking gets going then the wood will lose around 25% in weight. So yes you bought €250 worth of water and you no longer have as much wood as you thought. You could argue this point with the wood man but to be sure of being warm you should always over order and a safer quantity would be 120 quintale. My test log has lost 22.27% in weight since it was delivered on 10th July. If you have another heat source then you can cut back on wood and the chores that go with it. I always set a 14kW limit on stoves as any more turns you into a full time log lugger. An air source heat pump running on PV power is not far short of the cheapness of wood energy so a combination of the two makes for a more comfortable existence without breaking the bank. Maybe the heat pump open day last April has raised awareness because one no longer has to explain what they are these days. As the cheapest energy producer next to wood the air source heat pump is well on the way to ousting pellet stoves and other unworthy competitors. Meanwhile, back in the workshop, we have made a bit of technical progress on the way heat pumps are connected to tanks and how they can be integrated with other heat sources. A couple of simple changes allow the top of the tank to be top loaded for rapid domestic hot water extraction and a subtle connection enables the under-floor pump to use both wood heated water and heat pump water without disrupting the tank stratification. This might sound boring but I have seen no signs that the rest of the industry know what the problems even are let alone how to solve them. The Beeb site recently had an article on exceptional glacial melting going on right now making the 2012 records show that something really different is under way. Glaciers sliding on melt water can charge downhill at 40m a day. Some scientists believe wetter summers and colder winters could accompany this and judging from last year perhaps we should all take note and make sure we are as safe and comfortable as possible this winter. For my part I have been paying particular attention to future and existing wood based heating systems to make sure that in the event of a power cut there will be a base line of heating and cooking facilities. Systems with electric circulation pumps are especially vulnerable to power cuts and I now have a standard addition to circuits to make everything work. Apart from that I’ve started a list of things that might be life savers in the event of a prolonged snow-in with possible power cuts. Buy a battery charger for the car and plan how it will be connected. Tilley lamp – Coleman petrol lamp is fantastic. Death of the gas boiler? 1/. More bias towards water heating on the stufa. A bigger back boiler cuts the recovery time on the heat bank so the hot water is always there. With a little seasonal help from an immersion heater there are very few gaps left where a gas boiler would be useful. 2/. Bigger solar panels. Three layers of safety enable our big 450 litre heat bank to handle around 7.5 square metres of panel especially if they are tilted steeper for an autumn/spring bias. Steeper angles give a much flatter and fatter production curve which helps the solar panels match all the hot water demands well into the shoulder months without overheating in the summer. Oversized panels connected directly to the heat bank also enable pool heating with any of the other connected energy sources. There is a useful Excel model on the www.heatingitaly.com web site for calculating solar panel energy around the Perugia area. You can also get the ‘Heating Guide’ on the web site – ask me to e-mail it to you if you can’t download it. 3/. Immersion heater. Not seen much in Italy – where using 3kW of electricity is deemed excessive – immersion heaters are surprisingly useful and in practice punch well above their weight. The cost of use is similar to gas but the £56 capital cost of the heater on the heat bank is trivial compared to a £2,000 gas boiler with extra for a flue and servicing. There will only be a handful of days when neither the stove nor the panels are producing enough energy. Tests this, rather wet, autumn found that running the immersion heater for a mere 4 hours a day was enough to keep the showers flowing hot until evening use of the stove took over. If you have PV solar panels then immersion heating is a complete no brainer. Use some free power to top up the tank in the middle of the day. Alternatively without PV assistance the heat bank is best heated on cheap night time electricity when there are no other appliances running. Bear in mind that there are only about 2 months when minor electrical top ups are necessary; otherwise wood and solar are enough. If you have an existing tank without an immersion heater boss there is no need to go without immersion heating. Just mount a remote immersion heater on the side. It’s easy to fit and works on a gravity circuit. In some ways this is the best way to do the job anyway; a plumbers’ nightmare is the seized up immersion boss where the tank itself tears open rather than let the heater unscrew. There have been a couple of low budget projects this year where the inherent simplicity and cheapness of the heat bank approach has made the job much quicker and simpler. As the heat bank comes fitted with all the pumps, regulators and controls for a complete system it is very easy to ‘plug and play’. Just connect some 10 pipes and everything is ready to run. Connecting solar panels, gas boiler etc can be left until later as the immersion heater is enough to get the house going for an immediate summer let. As the plumber has little to buy (and mark up) and many hours saved, the plumbing bill should be greatly reduced even to the extent of making the heat bank effectively free. All the other heat sources can then be added, when needed, with minimal disruption. The heat pump era has arrived. 2010 has seen heat pumps gaining ground, particularly the cheaper and simpler air source pumps (ASHP). We have seen the arrival of several new, compact and efficient ASHPs running the latest R410a refrigerant. Some vendors are still charging premium prices for out of date models so take care if you buy. In Italy, energy from electricity costs about the same as gas. A heat pump can produce between 2 and 5 times as much power as it consumes and this makes it inherently very cheap to run. In fact a heat pump running on PV panels will compare well with a wood based system. A smaller modern, well insulated house needs so little power that cheap, low powered ASHPs will replace gas boilers over the next decade. Chinese models, using many European and Japanese components, are available for around £1,000 so the outlook for gas boiler manufacturers is starting to look bleak. Modelling of ASHPs running at optimal times such as warmer days or cheaper night time tariffs show the need for large heat banks as buffer stores so if you are planning a new house leave some space free for a couple of tanks. This is a typical story. In September or October John remembers to buy 100 quintale of split wood for 1,200 Euros. As usual, to save on handling, the wood was sawn and split and sent up the conveyor into the truck just before delivery. Whole trunks don’t dry half as well as split logs so the wood was still wet with 30% water. John had bought Eur 400 of water, but his troubles were only just starting. While the fire boiled the water out of the logs it burned cooler and John’s 84 quintale of actual wood produced only 3.4kW.hrs per Kg. This produced 23,800kW.hrs of heat – slightly short of the 25,000 his house needs. If John had stacked and dried wood from the season before it would have dried to below 20% and he would have got over 4kW.hrs per Kg. That’s about 23% more power; 2,900kW.hrs which is more than he would need, leaving some left over for next year. In extreme cases the difference in energy production between very wet and very dry wood can be over 50%. So take note. Don’t buy wood at the last minute. At the very least buy it in the spring and sun bake it all summer. Buy more than you need to start getting ahead. The way you burn the stufa can make a difference too. Wood burning very hot will burn off the tarry creosotes which gives more heat and keeps the flue cleaner. If your wood is wet, try to keep a pile next to the stove to dry out and then feed it in at the sides of the fire to dry more while the fire burns hot in the middle. Being mean with one sad log smouldering away is false economy. The fire needs to be very hot to burn efficiently. This means you should never buy a bigger stove than you need. Case study PV solar panels. Our 4.6kW car port is still coming towards the end of the first year but already the result is taking shape. Roughly, one could summarise the story by saying that there was just about enough production to pay the bank interest on the loan and electricity bills were eliminated despite a decision to use more for water heating. Gas boiler use has consequently dropped to about one ten minute boost per month for unscheduled top ups. The case for borrowing looks rational. The bank made us deposit 10,000 Euros in a fund which historically yields about 5% and we save well over 1,400 Euros a year in electricity and gas bills, effectively adding another 14% yield on the refundable deposit. Of course the production meter is earning too but the bank gets all that. While everyone else’s bills keep climbing ours remain fixed until eventually the bank gives us back our money and we keep further production payments too. If you work out the cost of not doing this you would be shocked at the difference. Many will see their whole retirement fund vanish under rising energy costs while the ones who took the plunge could actually retire on the proceeds of a large PV array. An unexpected boon comes from the quality of the power when the sun is shining. It took a while to figure out why the toaster worked so much better at the weekends! Money earned is proportional to power produced. Note the huge differences across the year. The monthly totals show that the panels almost never produce near their rated output; one third in winter and two thirds in summer is more like it. These stoves are popular for a very good reason. The quality is outstanding and they work reliably for years without cracking up and leaking. Clip in back boilers are available and if needs be can be replaced easily without writing off the whole stove. Demand in Italy has been consistently high so the time came to start importing them to order. The first batch arrived without a hitch and very robustly packed. Currently the most popular model is the 750 flat top which develops a useful 14kW and is even good for cooking on. For a small modern house the Solution 500 is well worth a look with a pleasing combination of tradition with modernity. Dramatic polished stainless steel sides can be ordered to replace the ones shown here. First of all, DPS heat banks are no longer sold under that name. The company is now run by Specflue, a much bigger and more stable company. Apart from a price hike everything else is the same. The same product is made in the same factory by the same people and is still the best of its kind in Europe. All the heat banks we’ve used in Italy so far showed that the only big variation in specification was whether under-floor heating was needed or just radiators. So to simplify matters here is the ‘Italian Job’ standard specification with the under-floor heating module offered as an extra. ‘• 475 litre stainless steel tank rated for 10 bar 663mm x 2,000mm – even good for tall tobacco towers. • Hot water temperature regulation – prevents scalding from extra hot water. • Pumped outlet for radiators and towel rails – use the same line for pool heating too if needed. • Temperature regulator assembly for gas boiler connection – corrects return temperature to boiler. • 3kW electric immersion heater – with robust timer switch wired in. • Thermostat for over-heat protection – turns on radiator pump to dump excess energy. Special offer – this spec for £4,288 inc. VAT and delivery to Central Italy. That’s 10% off the factory price and free delivery! Price with under-floor heating module – includes pump + temperature regulator. For direct connection to UFH manifolds. £4,788 inc. VAT and delivery to Central Italy. This offer will be held until the end of November unless any significant price changes come from the factory. This fabulous stove is such a good partner with a heat bank that they are often ordered as a matched pair. I have written enough before on the stove so we’ll get straight to the pricing which is shown inclusive of VAT and with some recommended extras. There are a few colours to choose from but so far everyone has gone for green. Black is the cost free default. Transport will vary depending on what else is coming over, for example with a heat bank the stove could be tucked on for nothing. Let me know in good time if you want one brought over. You’d be amazed how quick some installations can be. As the heat bank comes as a complete plumbing system – with all the pumps and wires connected – there are only some 10 pipes to connect up in the technical room. The modular nature of the system means it can be used immediately for hot water delivery just by turning on the immersion heater. 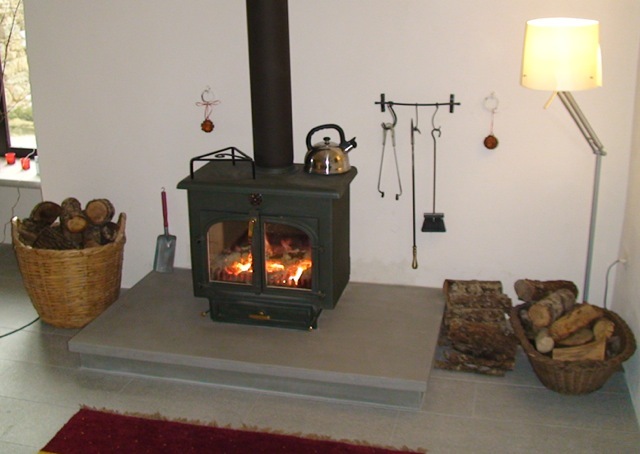 A wood burning stove, near the heat bank, can often be connected with just 2 pipes and no pumps and controls. The solar connections can be left for later as they won’t be of much use until next summer. So if a cosy Christmas in Italy appeals you have 4 clear months to get the job done. 2 to get the heat bank and wood stove out here and another 2 to get them plugged in. Christmas is often the big marker for the real start of winter. Until then an evening light up of the stove with occasional days is often enough to keep things cheerful. These days are limited 6 people so there is always plenty of time to talk over individual projects. If you need to stay we can offer accommodation. The next seminar is on Thursday 22nd September. See you there? Seminar dates are set fairly arbitrarily. If you have a date you can manage let me know and I will see if I can build the next one on that. Since the write up in the last issue, demand has been high for the magic low energy pumps. No wonder; at €1,550 and old pumps costing about €150 a month to run the payback is around 2.5 years. As fitting is usually a quick swap-over with the old pump there is an opportunity to add some plastic solar panels to the circuit at the same time. A set of four panels costs about €1,200 and will significantly extend the swimming season. Often fitting is as easy as chucking them on the bank by the pool house. Like all panels we only want them to work when they are hotter than the pool so a solenoid valve is needed in the new circuit. A Delta-T controller tells the solenoid when to pop open. The solar circuit – easier than you think. Given a tank with a solar coil the rest of the installation is easier and cheaper than most people imagine. There are only 3 elements in the pipe loop. The solar panels at one end of the loop, the solar coil in your tank at the other and a combined pump station and controller to make it all go round. The easiest DIY solution is a ground mounted array screwed onto pre-cast concrete blocks. You can buy special insulated tubes or16mm insulated copper pipe on a roll is easily obtainable and after foaming it into bigger plastic tubes it can be laid into a trench – just don’t forget a pair of 0.75mm section copper wires from the sensor on the panels to the controller. Another sensor goes from a sensor pocket on the tank to the controller. Once the circuit has been constructed and pressure tested with air you can fill it with solar fluid. A garden weed sprayer is perfectly capable of pumping the circuit up to 3 bar. Roof mounted arrays can be more involved as often they have to be integrated rather than over mounted. Costs? The starting point is about €2,500 which should set you up with a couple of panels and a pump station along with some tube and fluids. 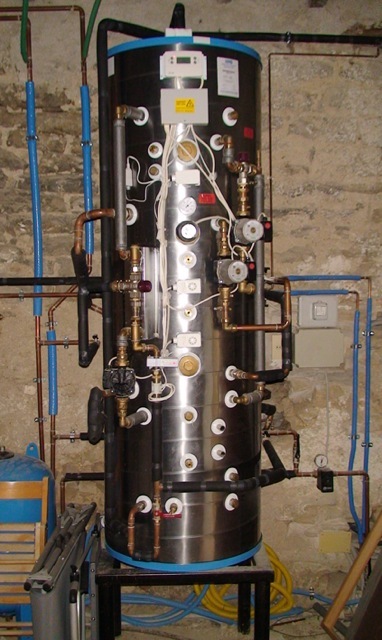 Gas powered summer hot water costs vary around the €600 mark so the pay back for the panels is about 4 – 5 years. The sun has no off switch! The biggest problem with oversize arrays is that in the hotter months a huge surge in energy has to be dealt with and often jettisoned. A swimming pool is a handy reservoir for heat but even that will be hot enough by August so energy might have to be dumped to a radiator, ground tubes or poured down the drain. It is often overlooked that the solar coil in your tank has a limited transmission capability so while we welcome masses of solar energy in spring and autumn it would be better if the panels would work less efficiently in mid summer. Luckily we can achieve just that by setting the panel angles steeper to suit the shoulder months and tame the hot ones. The diagram shows how a 7.5 square meter array at 30 degrees can be enlarged to 10 square meters at 60 degrees to give the same peak delivery but a much wider production curve with a good extra month of useful production on each end. When the winter sun is really low the panels are in their element with relatively huge gains in useful production. For an idea of what this power represents there is a line across the graph to represent the power of a gas boiler running for an hour a day. It is relatively cheap to add 1 or 2 more panels to an array so for ground mounted installations, where the angle can be chosen, this is really worth doing. Have a go with the panel angles spreadsheet on www.heatingitaly.com to check out your own ideas. A local supply of 1.5” screw in immersion heaters has just made it easier to construct the remote immersion heaters that can be retro-fitted to most existing tanks. Now an insulated 3kW remote heater can be yours for just €110. A pressure release valve is incorporated in the design to prevent anyone from closing off the valves at the tank and then boiling up and bursting the heater. Connection is usually very straightforward. The heater module is connected by a pipe to the top of the tank and another to the bottom. When the heater is switched on the hot water circulates up to the top of the tank and so produces the ideal top down loading. This is even better than a regular tank mounted heater so if you ever find one is stuck in don’t risk breaking your tank to remove it, just fit a remote. Immersion heaters are particularly useful for solar PV owners and for anyone else wanting to use the latest cheap night time electricity offer. Compared with the cost of a gas boiler this looks like the best heating bargain ever for domestic hot water production. Last April we all waited with bated breath for the new decree on PV solar tariffs. Before the announcement the industry ground to a halt as no one knew what their deal was going to be after the usual months long application period. Ironically the final verdict – wait for it – no change for the time being and the old reducing tariff table still applies. Well thanks for that. Now what should one do? The tariffs are falling on a preset schedule and panel prices are falling too. The return on capital of almost 15% still applies and this is certainly worth chasing despite the difficulties along the way. It is not just the tariffs being changed as different comunes seem to draw on a reservoir of reasons to object. 3 months ago a ground mounted array was an easy choice, car port mounted arrays would take months but now roof mounted arrays are practically instantly granted with the caveat that they have to be integrated in the roof and not over the tiles. My local PV guys have a good solution to the dilemma. You pay €1,000 for getting the comune permissions, Enel survey, and GSE contract ready and only then, if the tariffs are still satisfactory, do you sign the papers. If not you can walk away having only lost €1,000. I think this is the only way to go, and the sooner the better, as there is no certainty that this deal will be around for much longer. Pool pumping on 200 Watts surely that’s impossible? 6 kilowatts of free power! surely some mistake? Becoming a regular feature, these days involve no more than 6 people so there is always plenty of time to talk over individual projects. Despite a day crammed with interesting analysis and information there is still time to meet new people and have a good chat over lunch. Delegates have come from all over Italy – Sardinia is the record to beat. It’s great to see how to save a lot of money in the future and have fun at the same time. Later in the day we relax a bit with film clips of badly installed boilers blowing up and new pool pumps running on the power of a couple of light bulbs. Maybe, if there’s time, we fit in a 5 minute stroll over to our Etruscan tomb. The next seminar is on Monday 30th May. See you there? Your 1.5kW pool pump is costing hundreds of Euros to run so let’s ask why. First the pool man played safe and installed a bigger pump than was necessary. Better for you to have a big electricity bill than for him to have to come back and fit another pump eh? The pump has 2 main jobs. First we need plenty of power to run pool tools such as cleaners, vacuums etc and also to wash the bugs across into the skimmers. After that comes filtration but using the same power to do this is where the trouble starts. Energy consumption rises with flow as a square law, or higher, so high power filtration pumping is not a good idea. Even slight reductions in flow can halve the electricity consumption. The Pentair IntelliFlo shown here has a permanent magnet motor which is 30% better before we even begin to throttle it back. It can be set to give high speed bursts and then settle into long, quiet pumping runs using a mere 200 Watts. The bottom line is that 70% savings can be expected. You can find these pumps on the net for £1,600-2,000 odd but often we can supply and fit one for £1,500. Because of the adjustability of the pump one size fits all. Over the past 4 years I have monitored gas consumption for our 280m sq farm house. Each year has seen the addition of another tweak to beat back gas consumption. This set of graphs clearly shows the changes. A gas leak made the graphs a bit shaky at the edges but the general picture is clear. Each successive year shows how gas use is reduced. Despite the 12kW stufa supporting the gas boiler 4 – 10% of a tank is consumed every month of the first year. The following year we consciously burn more wood and the wet solar panels are fitted – a dramatic reduction is the result. Next the PV panels allow the immersion heater to be used. Now with more immersion heater use the monthly gas use falls to between 1 and 2% of the bombola (which takes a good €1,000 per top up) so it should now last for 3 or 4 years between fill ups. Almost all of this now relates to cooking and the gas boiler is largely redundant. That sounds good but you could do better. As discussed in the last newsletter, with a bigger stufa, bigger panels and a bigger tank you really can chuck the gas boiler in the skip. Over the next 10 years these simple devices will be as mainstream as gas boilers are today. It’s time to make sure we all know what they are and what they can offer us, especially as they work particularly well in the sunnier Italian climate. You’ve already got one heat pump – the fridge. It takes heat from a source – 2 litres of milk, 5 beers, cabbage etc – and moves it up to a higher temperature in order to dump it to the radiator at the back of the fridge. So heat is pumped from a cold place to a hotter place. Some of the heat at the hotter place comes from the fridge motor but most of it comes out of the milk, beer and the cabbage. 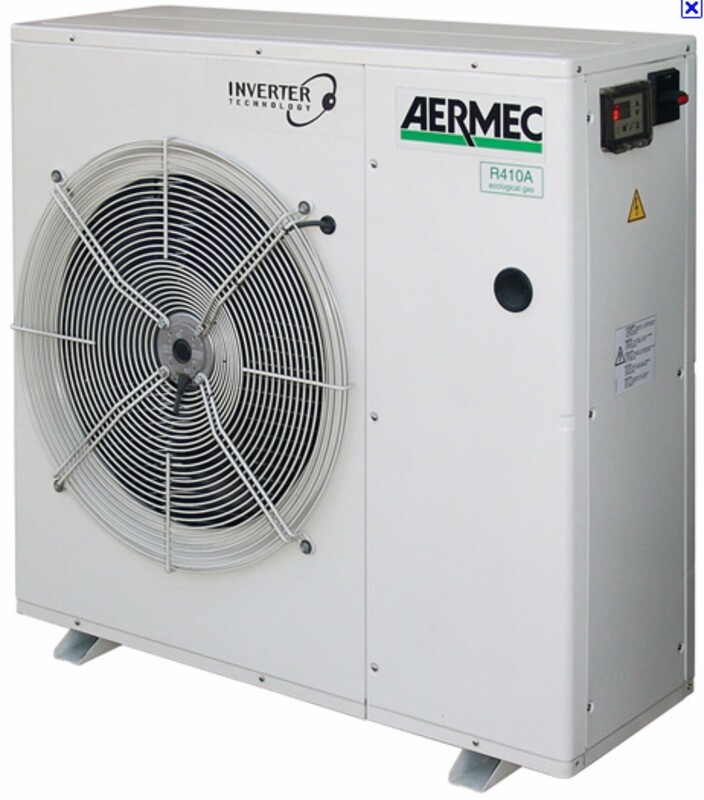 The energy is moved from air – in the fridge – so this is an air source heat pump. Now let’s scale up the fridge motor, shrink the cabinet and park it all outside the back door. We end up with a machine that can move heat from the air outside the house and deposit it at a higher temperature into the hot tank, radiators or under-floor heating pipes. The service life is similar to a fridge – quiet uninterrupted performance, year after year, with little or no attention. As the ASHP is moving energy rather than making it there is a limit to how much can be delivered compared to how much is put in. The ratio is called the Coefficient of performance – COP. You’ll see claims of 4 or so but the real world results (according to a recent Energy Trust survey) are nearer around 2.5, a lot less but still pretty good. There are a few tweaks to be made on the installation which should restore the COP to 3 or better but I’ll save those for another day. In the hierarchy of cheap heat sources wood is still king but heat pumps run such a close second they push similarly priced pellet stoves into pointless oblivion. RIP we won’t miss you. Psst – 6kW of free energy Want some? Apparently it’s hard to give out free fivers in the street. It just looks too good to be true. Here’s another free fiver and it goes like this. • A typical domestic electricity supply here is 6kW. • The free 2kW (you also get paid for producing) becomes a free 6kW into your hot tank. We are working hard to find the perfect ASHP to partner the 450 litre DPS heat bank so watch this space. You can buy a tin of biscuits for €10 or a cheap stove for €300 and structurally they have a lot in common but often the biscuit tin will be around a while after the stove has burnt and corroded. Cheap cast iron stoves come next. Cast iron lends itself well to fussy tresses of filigree but has to be bolted up in panels resulting in a leak prone structure which can crack easily. Models that heat water have the back boiler cast directly into the back panel and when thermal stresses finally cause cracks the only recourse is to throw away the stove and start again – a false economy indeed. There is a big difference between a Clearview stove and any of the above as one would expect for a £2,200 price tag as on the 750. A Clearview stove is made of thick steel plate; so thick in fact that 4 men struggle to lift a 750. The plate is precision cut and then folded up on a bending machine before being welded up into one solid structure. Channels are incorporated to duct heated air to the door air wash and the whole lot is then protected by fire resistant panels and more steel plates. Doors are double glazed to give a great view of the fire which might be as hot as 700c. The best bit is the back boiler which just bolts in and can be replaced if anything ever went wrong. This is a stove that should last a lifetime. The Clearview 750 is featured here because it is becoming the mainstay for many installations. With a total output of 14kW it can carry the total heating and hot water load for many of our houses. The 7kW back boiler means that a useful amount of power goes to the heat bank and we can have a nice big stove without overcooking the room. You’d be amazed at how much you can cook on the flat top too. I prefer to import these in batches (cuts delivery costs) so please give plenty of notice if you want one. I have brochures and colour samples here. A ground floor cantina is an obvious place to house your heat bank but if you want to have a wood burning stove connected from a room above it will have to be on a pumped circuit. With all the safety precautions and controls this costs at least €2,000 more than a simple gravity circuit so it pays to look for a better location. Ideally the heat bank needs to be very close to the stufa and a few centimetres above it to enable a virtually cost free gravity circuit to work. The drawing above shows how a corner fireplace is replaced with a fabricated fireplace and a niche to partially hide the heat bank. A plain door over the heat bank makes it all disappear. A neat variation on this theme (shown here) is to reverse the niche access to the other side of the wall and to cover the heat bank with an airing cupboard. This is particularly suitable when the walls are not thick enough to hide a 66 cm diameter tank inside.